Welcome to Eventegg's Gold Coast city guide which is filled with numerous suggestions and tips for an exquisite travel time in the city! Captain Cook could never have imagined what the Gold Coast would become when he first spotted it in 1770. In the mid 1800s, runaway convicts from the nearby penal colony were able to hide in the wild hinterland area. Europeans began to settle there in the 1820s and places like Southport became favourite holiday spots for well-heeled Brisbane residents. When Surfers Paradise became popular in the 1920s and 30s, the region was transformed and the region began its climb towards the top of the list of Australia’s tourist destinations. Today it is the sixth largest city in Australia and the Gold Coast City area stretches to includes several other smaller towns and municipalities. Around 10 million tourists visit the Gold Coast area every year. Miles of beaches and hundreds of high-rise hotels have established its image all over the world. The area is famous for its surf carnivals, casinos, glamorous meter maids and its relentless focus on entertainment and partying. More recently, it has drawn visitors who come specifically to visit its theme parks. Eco-tourism is another drawcard. The rainforest hinterland, and the many flora and fauna parks have made wildlife (almost) as popular as nightlife. Gold Coast City is a major film production centre - the third largest in Australia. A number of TV and film studios have based their operations there and the Institute of TV and Film with its film school are also contributing to the reputation of the area for its Australian and international productions. As you would expect, many of the sporting and leisure activities on offer are water-based. Gold Coast will be in the world spotlight when it proudly hosts the Commonwealth Games in 2018. Where is the Gold Coast? The Gold Coast is a coastal city on Australia’s east coast, in southeastern Queensland. Beginning at about 35 kilometres (21 miles) south of Brisbane, it contains several other towns and stretches from Beenleigh, at its northernmost point, to Coolangatta, which is close to the Queensland-New South Wales border. The city is made up of approximately 58 kilometres (35 miles) of beaches – many of them renowned surfing hotspots. Some of the more well known are: Main Beach, Surfers Paradise, Broadbeach, Mermaid Beach, Miami Beach, Burleigh Heads and Coolangatta. The Gold Coast airport is about 25 kilometres (15 miles) south of Coolangatta. For transport to the Gold Coast there are taxis available but the most economic option is coach travel. Several bus routes serve the popular areas and the Tourist Shuttle will go directly to most major hotel and apartment complexes. Gold Coast City has recently upgraded its public transport system; there is a network of services provided by bus, train, community transport and hotel and tourist services. A new light rail system is scheduled to begin operation in June 2014. Tourism is a major feature of the Gold Coast and the attractions to visitors are concentrated on the foreshore and along the hotel strip. The hinterland is a must for appreciating the natural features of the region. Currumbin Sanctuary, Fleays Wildlife Park and Outback Spectacular are also worth a visit. There are wineries and outlets for local produce for those who are looking for Gold Coast gourmet treats. Apart from the obvious attractions of the beaches, visitors and locals enjoy the many aquatic centres and take advantage of the facilities for skiing, boating, jet-skiing and fishing. There are numerous sports complexes - and bike hire for those who want to take in the sights and get fit at the same time. The theme parks are a major attraction. The most popular are Dreamworld, Seaworld, Wet 'n' Wild Water Park and Warner Bros Movie World and many visitors choose combination tickets to experience all of them during their stay. The Gold Coast is a vast shopper’s paradise. 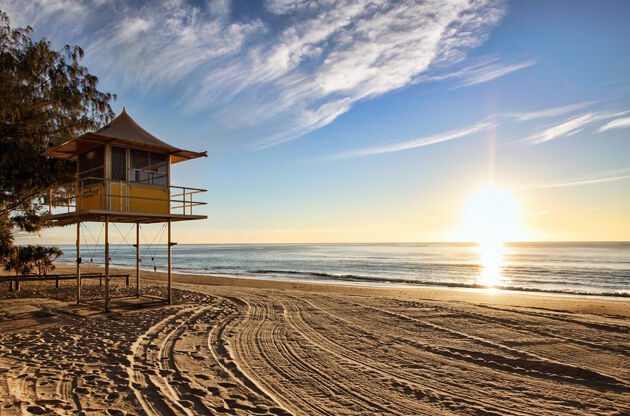 Southport, Coolangatta, Broadbeach and Surfer’s Paradise have possibly the largest centres. There is a Harbour Town factory outlet at Runaway Bay and regular markets all along the coast. With over 500 restaurants and cafés on the Gold Coast, it is not a difficult task to find the perfect place to eat. The cosmopolitan nature of the Gold Coast means that all major styles and cuisines are catered; visitors will be spoiled for choice. There is a growing wine industry in the region, particularly in the hinterland, and visitors are benefiting from new winemakers’ enthusiasm about showcasing their products. The Australia Zoo, made famous by the ‘Crocodile Hunter’ - the late Steve Irwin - is about a two-hour drive from the Gold Coast. You can go on a packaged tour or travel by train and courtesy bus. It is a popular destination for families. Queensland’s capital, Brisbane, is less than an hour to the north and the Sunshine Coast lies a further 80 kilometres beyond. Weather: The Gold Coast has a sub-tropical climate with higher temperatures, humidity and significant rainfall in the summer months – November to March. The rest of the year is generally warm and pleasant with average maximum temperatures ranging from 21-26C. Safety: The Gold Coast is generally a safe city, if visitors exercise normal precautions, particularly in areas where there are high volume visitor numbers. Tipping: In Australian cities, this is not normally required but, in restaurants, it is a mark of appreciation (about 10%) for better than usual service. In hotels and in taxis, it is entirely a matter of choice. There are countless venues which welcome conferences, congresses, symposiums, fairs and tradeshows and which will suit all budgets and styles. A few examples are: the opulent Intercontinental Sanctuary Cove Resort, the Jupiters Hotel and Casino complex, QT Gold Coast and the RACV Royal Pines Resort.